Quality-made foam pads for every detailing challenge! The Cyclo Dual-Head Polisher has two small heads as opposed to one larger one. 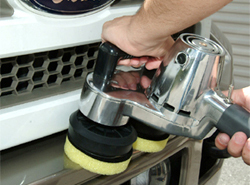 Since there’s no other polisher quite like it, it has its own line of pads and accessories for every detailing need. These pads are different from our other dual action pads, so take note of each color and its purpose. The Cyclo pads are 4” in diameter. Made of high quality foam, they vary in density in order to tackle specific jobs. For example, the white pad is the least dense in order apply wax or sealant without abrading the paint. All the pads have hook & loop backing securely bonded to the foam. This allows you to change pads easily. Below are descriptions of all the varieties of Cyclo pads. Please note, you will need a pad holder in order to use the hook & loop pads. Cyclo shown with hook and loop pad holders and yellow cutting pads. Hook & Loop Pad Holder: This is a rubber boot that fits over each head of the Cyclo polisher. The bottom of each boot has a hook & loop surface to hold pads. The pad holders fit snugly over the heads and they will not slip off or shift while polishing. You will two pad holders for one Cyclo polisher. 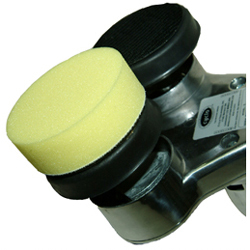 Cyclo Pads attach to the Cyclo Polisher by way of the Cyclo ProGuard Backing Plates or Cyclo Pad Holders, both sold separately. The Cyclo green pad is great for applying polishes and pre-wax cleaners. White Finishing Pad: The white pad is Cyclo’s softest pad. It is intended for final buffing and wax application. It will render a glossy shine without polishing. This pad has no cut. Blue Polishing Pad: The blue foam pad is the perfect pad for light polishing on any surface. Use it to apply wax for a fine gloss finish, or use it with a light finishing polish or prewax cleaner. The blue pad has slightly more texture than the white pad. Green Polishing Pad: The green pad is more aggressive than the white pad. It has a mild cut for gentle polishing. Use your favorite polish or pre-wax cleaner to remove light oxidation and bring out a bright, glossy shine. Orange Compounding & Polishing Pad: The orange pad is the all-around swirl remover, polisher, and paint deoxidizer. Made of high density foam, this pad will correct most mild to moderate paint imperfections and polish metal and chrome. Yellow Cutting Pad: The yellow cutting pad is intended for more aggressive swirl and scratch removal. It is made of dense foam and will work well with compounds and advanced swirl removers. This pad is comparable to our Wolfgang™ yellow cutting pad. Yellow Scrubbing Pad: The yellow scrubber is the most aggressive pad. 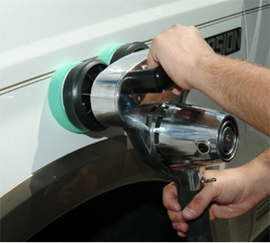 It is the highest density foam and will take care of your most stubborn surface problems. Use this pad to remove bugs, tar, sap, and as an aggressive paint deoxidizer. Cyclo Yellow Scrubbing Pads remove bugs from bumpers. Remember, the Cyclo has two heads! Pads and pad holders are sold in packs of two.